The NTN10 has a simple but important function, which is to stream navigational data around the boat’s existing wireless network. It is suitable for medium to large leisure boats that typically have wireless networks on board. 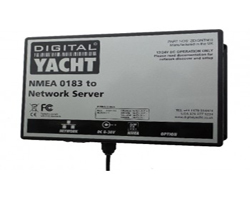 NTN10 converts NMEA0183 data to UDP/TCP network data packets that standard navigation programs can read. The NTN10 can be configured to use either 38400 or 4800 baud rate and can be wired to your AIS systems and connected via RJ45 to have AIS and Internet data all on 1 Wi-Fi network.